Base layer materials explained, compared and reviewed. ‘Base layer’ is the name given to an item of clothing worn next to the skin during sport or activity. It is typically the case, particularly in the UK, that you will want such a garment to quickly remove sweat (a process known as ‘wicking’) because if it doesn’t then you get wet and that makes you cold. That’s not always desirable though. If, for example, you’re in a hot desert, then will you want the opposite. I refer to “tops” throughout the article but the information applies to bottoms too. This article was originally published in May 2012. In September 2014, I overhauled all of the content, updated it, added the comparison chart and generally made it better. I hope you like it. The most common type of base layer is broad category of synthetic. These are comparatively cheap, hard wearing and give by far the best wicking performance (i.e. they retain the least sweat). Usually made using polyester mixed with another material like polypropylene. Synthetic baselayers designed for sports can be very cheap (from £3 at Decathlon) and dry very quickly but they can also have really poor breathability leaving you sweaty and sticky. They also start smelling bad very quickly i.e. within an hour. They are fine for sport and short runs or cycles without anything over the top of them, but not good for longer outings or colder weather. No doubt you can find expensive sports tops with excellent wicking and cheap outdoor tops that are rubbish but you get the idea. Both types of synthetic baselayers are much tougher and retain their shape much better than the natural options below which means you can get a tighter fit, resulting in better insulation and wicking. The only real flaw with synthetic tops is the smell. As mentioned, the sports tops are terrible. The outdoor tops are much better than they used to be (“Smelly Helly” is an exaggeration) and I’ve not found them retaining any smell after washing. If you’re on your own, in a remote area or just on a short trip then it’s not worth thinking about. For longer expeditions or if you’re spending a lot of time in pubs/cafes/public transport then the smell and the feel can be a little unpleasant. In truth, it’s hard to go wrong with a synthetic baselayer. The safest bet is to go for a major brand like Berghaus, North Face or Mountain Equipment. Just avoid the cheapest knock-off ones and sports/running tops. There is a good range here. (If you do just want a cheap sports top then try Decathlon). Personally, I’ve had several long sleeve Helly Hansen tops for over a decade and use them all the time for running, cycling and shorter trips in the hills. See below. Helly Hansen’s iconic striped sleeves are the sign of an excellent baselayer. I have honestly never found a base layer that performs better. They are tough, close fitting (which is good for wicking) and have a good long cut on the sleeves and body. One of my Helly’s is over 10 years old and still as good as the day I bought it. Highly recommended. A popular alternative to the synthetic option described above is to use merino wool. It’s most notable for its incredibly odour eating ability. In contrast to the Smelly Helly, these can sometimes be worn for days or weeks at a time during activity and still smell passable in enclosed areas. They have a softer feel than synthetic tops which makes them feel warmer when you first put them on. Some people prefer the feeling, others find them a bit scratchy. They are notably more expensive than synthetic tops and not as tough (one of mine has holes in both wrists after two years). Even the thinnest types of wool tend to be warmer than synthetic tops so they are better suited to colder environments and less intense activity, particularly as they don’t wick as well (better than cotton but not a patch on synthetic). Running on a cold UK winter’s day, I found mine getting saturated with sweat and, similarly, my team mates skiing hard towing a pulk in Svalbard at -15C still preferred the more efficient wicking of their synthetic tops. These tops really shine on longer trips. If you are travelling for several weeks or more, or undertaking a less strenuous activity like walking or cycle touring, then they are really good. Icebreaker Merino Wool Baselayers: Probably the most popular brand, Icebreaker are a New Zealand company who make great quality tops. I’ve had one for about four years. They are quite expensive but they have a slightly cheaper Everyday range. Other brands include Smart Wool, Wool Power and Rab. New Zealand’s Icebreaker are the best known makers of merino wool garments and with good reason. Their range is excellent. Merino will never match polypropylene for performance but for a top that’s softer against the skin, warmer, looks a bit more normal and will stay fresh for days, look no further than Icebreaker’s Everyday range. In recent years, clothing using bamboo in conjunction with other materials such as cotton and lycra has started appearing. It gives a closer fit than merino wool, is much tougher and feels nicer against the skin without the itching feeling. Bamboo is similar to merino in other respects – it wicks reasonably well and can have impressive anti-bacterial properties – but the performance varies greatly. TrekMates, for example, made a fantastic bamboo base layer. It wicked much better than merino and is easily my favourite ever top (I’m wearing one in the photo at the top of the page). However, it is no longer available. In contrast, BAM have a wide range of bamboo clothing which is very well made but performs poorly. Coming out of the washing machine it dries much slower than a cotton t-shirt. If anyone can recommend a good bamboo range then I would love to hear from them. I’ve written to TrekMates but had nothing back. If you find one, snap it up. In some sort of exotic material one-upmanship, there are some base layers now available using coconut shells. They are even less common than bamboo and I’ve yet to try one out. TrekMates: Apparently no longer produced, the TrekMates bamboo base layers were superb (I’m wearing one in the picture above). Keep your eyes peeled for them on GO Outdoors, otherwise try Google shopping and eBay. BAM: A British company who produce a whole range bamboo base layers and other bamboo clothing. The quality is good (and thus they are not the cheapest) but I’ve found them to be thick and heavy, meaning they are warm and take a very long time to dry so not great for outdoor usage. Amazon: sadly, the esaiest place to find bamboo tops is probably just having a look on Amazon. Often treated like the devil’s own weave in an outdoor environment, cotton is rubbish at wicking. It saturates quickly and can be slow to dry out. For cool or cold conditions, cotton is not very good. However, in warmer temperatures, it’s great. Because a cotton base layer retains a lot of moisture, it helps you keep cool and minimise water loss which are both useful properties in hot, dry places. In contrast, tight fitting, fast wicking tops will make you hotter and drain moisture from your body quicker. I’ve used a long sleeved cotton shirt I bought in a supermarket for several trips. Aside from a desert crossing and mountain walking in hot Oman, it was also infinitely preferable to my bamboo and merino tops whilst hiking in a Patagonian summer and whilst cycling around the world – cooler and better sun protection. They also look like normal clothes which makes no difference on a mountainside but is good when travelling for long durations. Cotton is cheap, tough, readily available and looks normal. Best performance, longest lasting and good value for money. Best for high activity and shorter outings. Great for longer trips and travelling where they look and smell better. Good for lower intensity activites. At its best, a better performing and tougher version of merino. At its worst, no different from heavy cotton. 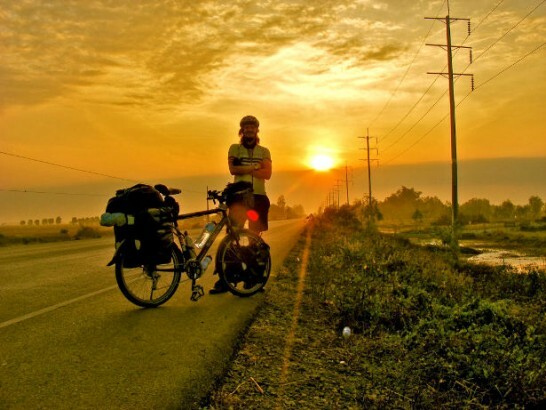 Good for hot places, trekking and cycle touring in warmer environments and travelling. Cheap and prolific. Find this article useful? I also have comparison articles for Camping Mats, Bivvy Bags, Midlayers, Multi Fuel Stoves and more. *NEW for June 2015* – Gas Canister Camping Stoves. Great article, thanks for the information. Very interested in bamboo as an alternative to merino. Thanks Tim. I’m a big fan of bamboo although most companies seem to have stopped making it and the BAM range is very slow to dry unfortunately. My partner is really happy with a Regatta Bamboo tshirt he bought this year, performance and odour control, but not old enough to judge durability. Funny I couldnt find it on the regatta webpage, but there are on amazon.uk!! My latest Icebreaker cycling merino tshirt has four holes after two months… not happy at all. Thanks for that Bego and great to hear that there’s still some bamboo out there, even if you have to trawl amazon for it. Sorry to hear about your merino t-shirt though. Mine lasted a year before the hole’s started appearing but it’s never going to be as tough as the alternatives unfortunately. I’m taking the family (wife, 7 & 5 year old boys) to Lapland in December of this year & don’t know which type of base layer to go for to ensure we keep warm. The most strenuous activity I can see us doing is sledging but I can imagine there’ll be a lot of sitting still (sledging behind huskey, reindeer, skidoo’s etc.). I need some advice on which material to go for. Hey Scott, sounds great. I’m jealous! I wouldn’t worry about performance/wicking since it’s not high intensity so forget synthetics – they can feel cold and get smelly anyway. Both bamboo and merino would do you well. Bamboo feels nicer (in my opinion) and is perhaps a little cheaper. BAM would be good. If you want really warm – and are feeling flush – then try Swedish merino brand: Woolpower. That said, I reckon you’d be absolutely fine with cotton skiing thermals. Stuff you can probably get from department stores as well as in the end of season ski sales. They’ll be warm, cheap and tough, and you shouldn’t be sweating for long enough for them to cause a problem. That’s a really useful breakdown – thanks. I run hot all the time, so my problem is that I overheat easily and then sweat a lot. My main issue is being hot and bothered while hiking – when I stop my clothes might get cold because they’re wet, but that doesn’t really bother me as I’m warm blooded enough for it rarely to be a problem (and in fact it’s often quite nice). With that in mind, and given what you’ve written, is there anything better than a loose fitting cotton shirt or t-shirt for me when hiking in warm or hot places? My only issue with cotton is the heavy, wet and clingy feeling can be rather unpleasant sometimes. Everybody recommends merino wool to me – but it sounds to me like I’ll just feel even hotter! Hi Mike, thanks for the comment. An interesting question. For warm weather, I would definitely not recommend merino. As you guessed, it will probably be hotter and certainly won’t get rid of that wet, clingy feeling. A light bamboo t-shirt might be a slight improvement – they can be a bit less sticky – but I reckon you’re best bet would be a nylon trekking shirt. You get them in outdoors shops, they’re always khaki coloured and often made by Craghoppers or Columbia (like this one). Avoid a really cheap knock-off one as bad nylon is really bad but any main-brand one – or one you can try on yourself – should be good for you. They’re really thin and hang quite loose (even when close cut) so stay dry and wick really well. Of course, wicking well in warm weather means you’ll loose more water than staying in that damp, clingy cotton shirt but it should be a lot more comfortable. So like anything in life, it’s a compromise. You’ve pretty much got it Mike. Just be aware that “nylon” is a big field. It includes Helly Hansen style synthetic baselayers which are superb wickers; cheap, nasty sports tops that, although they don’t hold much water, hardly breathe at all; and the trekking shirts which wick OK but mostly work well because you wear them on their own and they are so thin and loose that a breeze takes away any moisture. You are right that it’s a compromise though. That’s why I don’t go in for any “Best Base Layer” stuff. They’re all just good for different things. 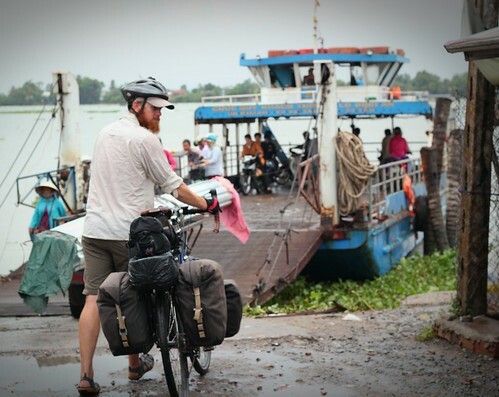 I cycled around the world this past year and brought along a range of synthetic and Merino wool shirts. However, in the end, nothing worked better than a 3-pack of white cotton shirts I bought at a thrift shop for $5. Sounds about right Terry. Cotton shirts were what I used on my own round-the-world cycle. I’ve got a 7k rowing race very soon and need to wear a skin under my club vest. No idea what the weather will be like but I need something breathable, easy to move in, comfortable, and warm. Though after the first 5 mins I will have certainly warmed-up so I need something that won’t allow me to overheat! That’s an easy one Natasha: Helly Hansen. They’re really popular amongst rowers (I’ve never discussed it with them but you see those blue/black-and-white stripes on rivers all the time). You could use any synthetic base layer made by an outdoor brand (e.g. Berghaus, Mountain Equipment, Lowe Alpine) but Helly Hansens are a good example. A synthetic top will perform better than any other material (i.e. wick away sweat/water fastest) and dry fastest (meaning it’ll keep you warmer). Best of luck with the race. If you do buy a baselayer online, please do consider using one of the links above – it means I’ll get a small percentage. Good Day Tim. This is a terrific article, especially the portions that discuss Merino Wool BaseLayer. I am the Sales Manager for a start up Merino Wool company under the branded name of WoolPro. I would like to tell you more about us, etc. How do I go about doing so? I can be reached at; [email protected] or (888) 717-5492. Ask for Aaron. Thank you Tim. I’ve found this blog by searching for base layers. I’ve been reading about them for a few days now, and this is by far the best article I have found on the internet about the subject. But I’d like to ask a couple of things if I can. -The article starts by saying that synthetics have the best wicking qualities, but then the “sport” variety of the synthetic is described as having bad breathability. If these things are synthetic but their cheap quality makes them bad at wicking, I wonder what they are good for, since I was looking at them for working out at the gym. Also: what do you think would be the best kind of layer for everyday life? I’m about to move to London and I’m very sensitive to cold. I was looking for something to wear anywhere- to work, to run errands, etc- under my main top. Probably merino? Have you ever worn a base layer for your everyday life too? 1. WHAT ARE CHEAP SYNTHETICS GOOD FOR? All the synthetics hold very little water. So an expensive outdoor top and a cheap football top will come out of a washing machine feeling almost dry. However, cheap sports tops aren’t very breahthable. In other words, they feel really sticky when you get hot in them. Consider it a bit like a plastic bin bag. That wouldn’t hold any water and would dry off really quickly but if you wore it out running you’d get covered in sweat because water can’t pass through it. They’re good for being really cheap and not getting wet. If you’re outside in a breeze and/or for a short period then they’re OK becaues you don’t get too sweaty. For the gym, I’d usually just wear a cotton t-shirt. They’re cheap, comfortable and don’t smell. And if they get sweaty then you’re in a mild, air conditioned environment it’ll help keep you cool and you’re unlikely to freeze. If you’re really anti the sweat then just get a proper synthetic running top. Cotton’s popular for a reason. It’s cheap, comfy and warm. That, of course, is what most people wear. If you’re particularly active and/or get cool from sweat then I’d suggest bamboo. It’ll be just as good as merino for most activities but is much tougher and usually cheaper. Merino’s good but usually doesn’t last long and some people find it itchy. Thank you Mark, this helped a lot! Hello Tim, great to read your enthousme for bamboo. I’m working on an online store that is 100% focused on bamboo basel ayers and underwear. I have contact with a designer who also has production management with 95% bamboo. Am now working on the business model, because I am located in Netherlands and need a larger market. There are big brands with big marketing budgets and the stock is capital intensive if you want to deliver quickly (and of course you want for your customers). Would you like to ask some questions. For example, which of bamboo products seem most logical to first offer (sports boxer, base layer short sleeve, base layer long sleeve, pants longsleeve) and one color (black?) Or also another (gray, blue, or ….). And for what audience? Outdoor, Running, Walking, Fitness, underwear for team sports, Cycling. And what price you think is fair to ask? Thanks for the messsage. Cool that you’re thinking about starting an online store. I think bamboo clothes are popular at the moment and there perhaps aren’t that many good sites to get stuff from. To me, there’s a distinction between outdoors kit that uses bamboo and normal clothes that use bamboo. It might be worth focusing on one or the other rather than trying to straddle both and perhaps confuse people. I don’t know anything about strategy in the bamboo clothing industry but if it was me, I’d focus on long sleeve black tops. As for pricing, I don’t think I’d judge on what was fair but rather how much it cost me to make/distribute, how much the competition was charging and where I wanted to position it (e.g. budget or premium). Best of luck with it and please do come back to let us know how you get on. Thanks for the heads up. Retailers are forever changing their URLs! Duly updated. Thanks for the tip James. I will try to get my hands on one. In general, I think the blended materials seem to produce much better results (and give me more things to write about)! Hey Tim, nice content and thanks for the redirect to Bam Bamboo clothing. As a cyclist for 10 + years, I’ve always used synthetic clothing but my skin gradually got worse and worse. I had no idea why until a dermatologist told me I had acne mechanica from synthetic fibres and to use cotton or silk. Not easy fitting a tight baselayer under cycling lycra. So far I’m really happy with BAM but am waiting in suspense to see their summer baselayer line. Would love to get an update if you know of any other “as close to natural” base layers that can be used for cycling. Thanks Alison. That’s really interesting. I think bamboo/merino blends are great. Tougher than merino (which is expensive and fragile) but better performance than bamboo/cotton (which is really slow to dry).